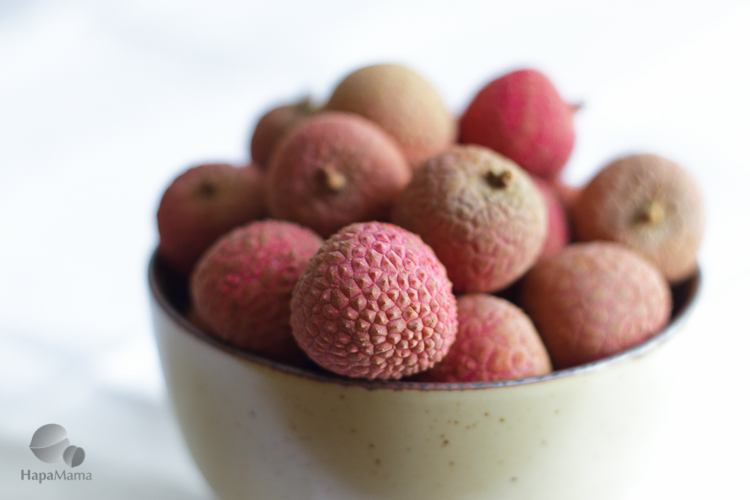 I’ve been seeing fresh lychees at the store lately– both at 99 Ranch (or is it Ranch 99?) and Trader Joe’s. So of course, I had to bring some home. They are one of my favorite fruits, although I usually stick to the kind in the cans, since the real things are hard to find. 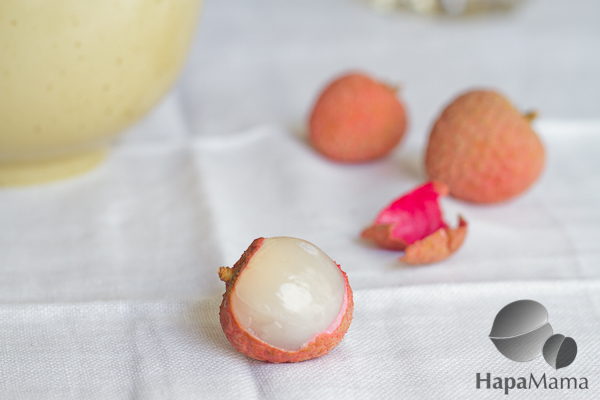 I can remember the first time I tasted a lychee, when I was six years old and visiting my grandparents in Taiwan. The prickly exteriors are a pain to peel,but you will be rewarded with a little morsel of deliciousness. One thing I did learn is that skins dry out a little if you leave the lychees on the counter for a few days, becoming more like peeling a hard-boiled egg. AFTER gently ushering the wild blossoms into sacks, and descending the hillside, a few of the men who gather blossoms for your cocktail, will then mount a bicycle a carefully ride the umbrells of starry white flower to a collection depot. Vraiment. So of course, I had to run out and buy some. Like on my lunch break. I did wait until a reasonable hour (and after photographing it) before opening it, though. St-Germain hints at each of these and yet none of them exactly. To me, there is something slightly green or peppery in there, too. Not being a big liqueur drinker, my first thought was that it would be a nice addition to a glass of champagne. 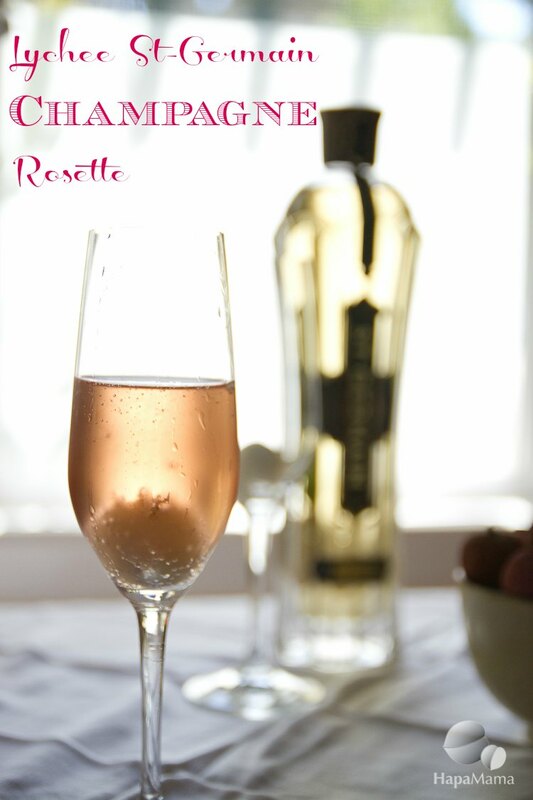 Specifically a rose champagne. With a lychee added, of course. 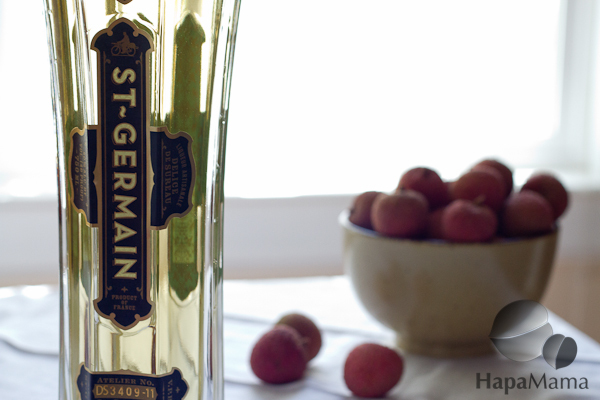 Place lychee in champagne flute, add St-Germain, and fill with champagne. A sante! Yum! Who would have thought a French liquor would taste like lychees? Cool! Interesting! Lychee was my Mom’s favorite fruit.